Arq will back up whatever folders you tell it to back up, but it doesn’t know where those folders really exist on your Mac. So, if you want to back up, say, a NAS that isn’t always connected, you may need to tell Arq to connect to the NAS first. In my case, my NAS is called “big” and the share on it is called “bignas”. I connected to it with the username “stefan”. The Finder mounted it at /Volumes/bignas. The “afpfs” tag means the Finder mounted it using AFP; if you see “smbfs” instead, it means the Finder mounted it using SMB. # If the NAS isn't reachable via ping, exit 1. # Otherwise, the osascript will pop up an unwanted dialog. Pick File->Save from TextEdit’s menu and save your file as “MountNAS.sh” on your Desktop. and checking the output for your NAS. If it’s already mounted, go to the Finder and click the button to “eject” (unmount) it. you should see a line for your NAS. Pick “Preferences” from Arq’s menu, click the Destinations tab, and double-click your destination. Click the “Before and After Backup” tab. Check “Run shell script before backup starts” and click the Choose button to find and select your MountNas.sh script. Then click Save, and close the Preferences window. Your NAS should still be mounted from Step 4. 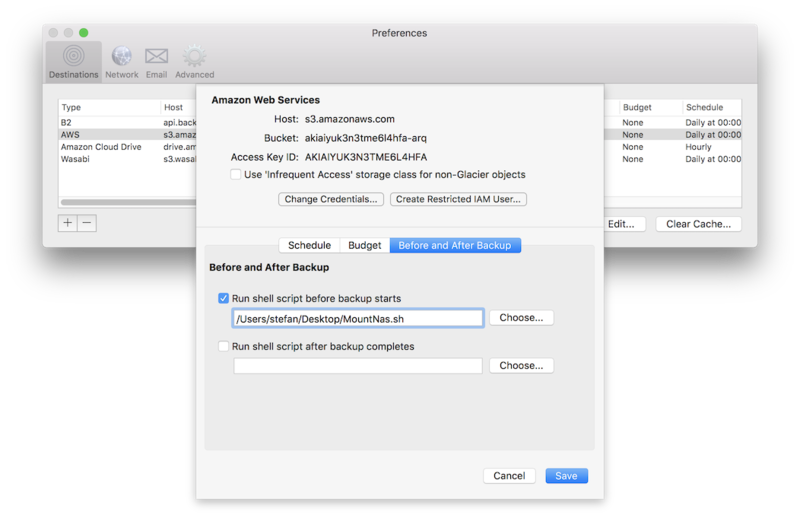 Pick “Add Folder to Backups” from Arq’s menu to add the folder(s) on the NAS that you want backed up. Go to the Finder and click the eject button to unmount your NAS. Pick “Back Up Now” from Arq’s menu. Arq will run the script to mount the NAS, and then back up the files you selected. Once the backup is underway, check in the Finder whether your NAS is mounted. If it didn’t mount, then Arq should report an error. If you need help finding the problem, please email us at support@arqbackup.com; we’re always happy to help! On Windows the process is different. In Arq for Windows you can tell supply the parameters for connecting to the NAS and Arq Agent will connect it when it needs to access it. Pick “Preferences” from Arq’s menu, click the Network Volumes tab, and click “Add…” to add your NAS. Enter the UNC path, enter your credentials (if needed), and click OK. Pick “Add Folder to Backups” from Arq’s menu to add the folder(s) on the NAS that you want backed up. Pick “Back Up Now” from Arq’s menu. Arq will run the script to mount the NAS, and then back up the files you selected. If it didn’t mount, then Arq should report an error. If you need help finding the problem, please email us at support@arqbackup.com; we’re always happy to help!